With the news that Chris Osgood’s on again off again groin injury has reached the point of furhter action Jimmy Howard had to step up and suit up against the Vancouver Canucks after just defeating the Calgary Flames in a shootout the night before. Against the Flames Howard let in four goals; something that has become all to familiar with the runner up for the 2010 Calder trophy for rookie of the year that has lead to many worrying that he may be falling into a sophomore slump. This so called sohpomore slump had the Detroit Red Wings netminder sitting atop the wins catagory within the NHL with 22 wins (Monteal Canadiens Carey Price is second with 21 and Anaheim Ducks Jonas Hiller third with 19) and is only 5th in the league for goals against (80). Yet still the need for him to step up is great with his mentor Chris Osgood being sent home early from the western road trip and the Red Wings recalling Joey MacDonland from the American Hockey League affiliate Grand Rapids Griffins. And step up he has. Last night Howard had an amazing game in Vancouver. Leading the once again injury-riddled Red Wings in magnificant fashion – to rob not only one but both of the Sedin’s the way he did last night was nothing short of spectacular. Over at Pro Hockey Talk on NBC Joe Yerdon made Howard’s save on Daniel Sedin the save of the night. 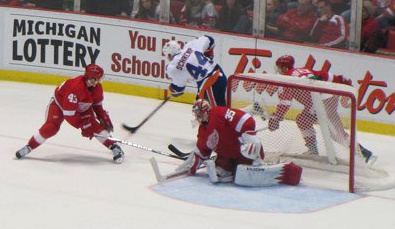 The game was forced into a shoot out as only Daniel Sedin from the Canucks and Red Wings Johan Franzen scored during regulation. In the shootout it was Red Wings Jiri Hudler that also stepped up and got the puck past Roberto Luongo earning the extra point for Detroit. Hudler has also been under the microscope this season. After his contract “expired” Hudler left the Red Wings and signed a two-year (one-year with a second year option) contract with Dynamo Moscow (KHL). He spent last season playing in the KHL only to see his team disband due financial hardship. The Red Wings had kept their rights to Hudler as he was an RFA when he signed with Dynamo Moscow. Not living up to the promise and hype he had left behind in Detroit when he took off for Russia there has been talk amoung the fans of Hudler being traded just as the Red Wings had done last year with the under performing Ville Leino to the Flyers. Is Ken Holland thinking the same thing? That I do not know; however, if Osgood is going to be missing extended time it is possible that there could be an up coming trade to find Howard another back up – if MacDonald doesn’t work out.